My family and I moved to Georgia in 2011 from Maine. I recently gave birth to my first child, Reagan, on December 18, 2014. My family and I spend lots of time together going to state parks and camping. I like spending time outdoors and going to the beach, as well as traveling. One of my favorite places is Belize, which is where my husband and I got married. I saw Old Town Trolley Tours at a job fair and it seemed like a great place to work. I have been on a few tours myself and I thought it would be great to be a conductor. Hello! My name is Jacqueline, but because of my love for jellybeans, I prefer the nickname “Bean”. I’m a native of Savannah. I love the city and all its bumps. I hope you have enjoyed your tour with us! Come back and see us, ya hear! It’s Bean Real Fun. Greetings! My name is William “Will”, and I’m proud to be a Conductor for Old Town Trolley. I was born and raised in Kansas, but always had a desire to move closer to the ocean. Having received a BA degree in Philosophy and a Masters degree in Theology I enjoyed working in a variety of different positions including administration, teaching, and pastoral work. After 25 years, I decided it was time for a change and decided to move south near the ocean. Upon my arrival in Savannah in 2004 I immediately fell in love with it: the Jewel of the Low Country, an old colonial city bursting with charm was too much for this Kansan to resist! In a strange but exciting way I’m still sharing my passion for history, not from a desk or a podium… but as a tour guide for Historic Tours of America…. WELCOME ABOARD! I was born in Corpus Christi, Texas. I moved to Georgia from Alabama in 1996, and have been here ever since. My fiancée, Tina has two teenage daughters that live with us. I have two grown sons that live in Georgia, and one son that is stationed in Japan. I love to work on motors/engines and have a 1978 Cutlass drag car. I also enjoy shooting pool, gardening and the beach. I was searching for jobs online, when I spotted Old Town Trolley. I am glad that I noticed the opening. It is gonna be fun working here! I am from Carrollton, Georgia. I have been married to my wonderful wife for 45 years. Our son came to Savannah to attend SCAD. When we came to visit him, we fell in love with this city. Our daughter has also moved here, so the family is all together. I enjoy hiking, walking our dogs, driving my jeep and spending time with my wife. Old Town Trolley Tours seems to be a good company that cares about the guests & employees. I look forward to a fun job that will be different every day. I was born in Columbia, South Carolina. I grew up an “Army brat”, but have always considered Savannah my home. My wife and I have been married for 20 years. I am a former Peace Corps volunteer and US government employee. I enjoy reading, especially books about travel and adventure. I am also a Civil War history buff. I was attracted to Old Town Trolley Tours because of my love of Savannah and its history. I came from a large family – “lucky number 7” of 7 children. I was raised in an old fashioned way. I have two children and they are my proudest accomplishments in life. I love my family! My favorite hobby would be spending time with my daughters and grandson. I also enjoy playing with my dog. I love the outdoors and nature in general. I came to Old Town Trolley to learn more about Savannah and have the opportunity to be with new people. What could be better? My wife and I recently moved to Savannah to be near our grandkids. We have four sons – Geoff, Bryan, Jason and Jeremy. We also have four wonderful daughter-in-laws and seven grandchildren. My wife’s name is Betty Ann. We are originally from New Jersey and look forward to spending time in Georgia. I retired from teaching special needs students for 30 years in June 2014. Our favorite activity is spending as much time as possible with our grandchildren. I also like to get out to fish and hunt when it is possible. I have a bus drivers’ license so I thought conducting the tours would be a fun thing to do. I love history. I am originally from Cornelia, GA in Northeastern GA (Habersham County). I am from the mountains of North Carolina/GA where I was a whitewater guide for 12 years. I have one sister who is a doctor in Northeast Georgia, and I am a Marine Corps Veteran. I like history and historical sites and museums, golf, fishing, whitewater canoeing and kayaking, sea kayaking, camping, reading, and watching hilarious movies. When I was 40, I needed to set down roots and have always wanted to live in Savannah; and that is what brought me to Old Town Trolley. I am thrilled to share my passion with guests. I am originally from Savannah. My wife Teresa and I have been married for 12 years and are still celebrating our honeymoon. We both share a love of scuba diving, music, and community service. I have a life time love affair with music. I made my living in the entertainment industry as a guitar player/singer and in several different positions in production. I am just an old Road Dog with 30 years experience. Did I mention that I like music? I tried working behind a desk and I loved the company but hated the desk!!! I heard from friends about this people oriented job outdoors and here I am. It doesn’t hurt that I love Savannah! I am a retired military (USAF) enlisted member born in Boston, MA. I am married to Karen and I have one daughter and a step-daughter and a step-son. I enjoy playing golf, traveling, oil painting, and playing with and training my dog. I am originally from New York. I am the proud mother of 3 beautiful adult daughters who all live in Maryland. I moved to beautiful Pooler, GA from Maryland with my husband of 31 years about a year ago. We are a very close family who enjoy celebrating holidays and milestones together with extended family and friends. The activity that I enjoy most every week day is talking to my 8-year-old granddaughter on her way to her Tae-Kwon-Do before school program to discuss our anticipated daily activities. My hobbies are planning family get-togethers, scrapbooking, and creating displayable memorabilia of family pictures. I met a cast member at the opening of the Tanger Outlet Mall who told me how much she enjoyed her job at Old Town Trolley and the rest will be history. I am a true people person who enjoys sharing information with people. Having fun should be my middle name! Based on the job description, Conductor is the job for me! I was raised in Connecticut, but like most Northerners got tired of the cold weather. I have a love of the water, so in 2000 I made the decision to move to Savannah. I have a lovely wife and beautiful daughter. I like to fish and boat and have an interest in history. My family always told me I should be some type of tour guide since I found enjoyment in showing folks around the city. I am happy to have this opportunity with Old Town Trolley. I grew up as an Army Brat, so I traveled all over the country. I moved to Georgia in high school and ended up at Georgia Southern. Go Eagles!! I settled down outside of Savannah and I am the proud parent of three beautiful kids. I love baseball and spend a lot of time at the ball fields with my boys. My favorite activity is spending time with my kids. I love Savannah and its rich history and I love being around people. I thought sharing the history of Savannah would be a very fun job. Hi, my name is Cindy. I am a real Georgia Peach! I was born here and spent most of my life in Savannah, GA. I recently moved back and love every minute of it! Thank you for coming to my hometown. I think you will find it as beautiful as I do! Y’ all comeback now, ya hear?! My name is Irenette but my friends call me Nette. 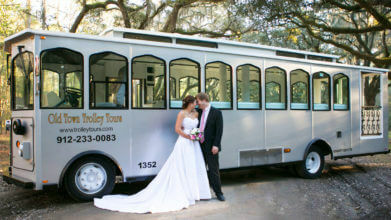 I have lived in Savannah all my life but I was never so knowledgeable about the town until I came to Old Town Trolley. I have one son who keeps me very busy. Before coming to Old Town Trolley, I held such positions as head teller at a bank, a Sales Rep, Customer Service Rep and a bus driver. Now I am a conductor. I was never much of a talker but I guess now I get to talk all day. My wife Judy and I live in beautiful Bluffton, South Carolina. We have four children and six grandchildren. I currently work as the Operations Manager after joining OTT as a Tour Conductor in February 2008. I really had a lot of fun in the Tour Conductor job. I had retired very early after a 25+ year career as a Human Resources executive for several organizations and was one of the fortunate few that really enjoyed their career choice. After retiring my wife thought I might want to keep myself a little busier. I had always had a love of history and wanted a really fun job. One day I saw an advertisement for Tour Conductors and the rest is, as they say, history. In October 2008 the Human Resources/Payroll Manager position became available and I moved into that position until June 2014. It was great to get to work for all of our CASTmembers in the Human Resources/Payroll Manager position. When I’m away from work I love to ride my bicycles, run and swim. I compete in triathlons and in 2014 I qualified for the triathlon age group national championship. I also love to race my Spec Miata in SCCA and I teach High Performance Driving on race tracks throughout the southeast. My wife and I love to travel together and see the sights this big old world has to offer. I’m originally from Springfield, Massachusetts. I’m retired after 20 years of service with the Air Force. I have 2 children with my wife Pam of 35 years and one grandchild name Luca. I moved from Springfield, MA to Savanna, GA in August 2016. My favorite actives include watching and playing sports. What brought to me Old Town Trolley Tours? I’m looking for a new and exciting career. I’m originally from Jacksonville, FL. Married for 43 years, have 3 children and 5 grandchildren. I retired from the Army as a Lieutenant Colonel after 21 years, also from Civil Service in 2014. I love to fish, hunt and travel. I saw the position in the newspaper and that’s what brought me to Old Town Trolley. I am a Savannah native and the eighth of nine children. I have been here my whole life and love this city that much! I love to play sports and especially love baseball, football, basketball, and swimming. I enjoy meeting people and love working in transportation which Old Trolley allows me to do!! I’m originally from Savannah, GA. I have 3 beautiful adult children. My favorite hobbies are mediating, family orientated activities and just plain loving people! I have always worked in the restaurant and hospitality field and really love people. I felt that Old Town Trolley would provide those two things for me. So here I am still loving it since February 3, 2003! I am originally from Savannah, GA. I live on Wilmington Island with my wife. I have been a guitarist for 35 years. We have a Blue Tooth Macaw, five cats, and a rabbit. I enjoy playing guitar, wood working, and carpentry. I am originally from England. I live in Savannah with my beautiful wife. I have 4 wonderful children and also 2 of the greatest grandchildren ever. I love living and experiencing Savannah with my family. I enjoy having the opportunity to meet with our guests and show them the beauty and history of my beautiful lady, Savannah!! I’m originally from Texas. I ran my own business for 40 years, retired and moved to Savannah. I played too much golf and wanted to get involved. I am married with 2 kids. My favorite activities are golf and tennis. What brought me to old Town Trolley: I wanted a new Challenge. I’m originally from Savannah, GA. I grew up in Savannah. I have Political Science degree from Armstrong University. I’m a former Carpenter and a current Artist, Tour Guide. My activities and hobbies include reading, traveling and working with the prison ministry. What brought me to Old Town Trolley Tours: I saw an article in the newspaper and decided to give it a try. I am originally from Harlem, New York. I’m from the Melting Pot of New York City. I have been blessed with 2 beautiful children. I love people and I like to EAT! I have lived in Savannah since 1989. I have changed from a big apple to a Sweet Georgia Peach. My family and I love the beach and cook outs. I love to drive down I-95; it feels like I am going somewhere. I enjoy the simple things in life – some good food, good people and I am fine. At Old Town Trolley, I get a chance to do what I enjoy which is driving and meeting people from all walks of life. I can share my knowledge of Savannah with the public with that Old Town taste. I’m originally from Columbus, OH. I moved to Savannah in 2015 with my husband and 2 children. I drove a school bus for 9 years. I was a travel agent for a while before moving here. I studied Tourism and Hospitality at Columbus State College. My favorite activities are travel and reading and spending quality time with my family. What brought me to Old Town Trolley: I wanted a job that I could share my love of history with other people. I am originally from Macon, Georgia. I come from a family that always considers others. We are hard working, always striving to be better, and caring for ourselves and others. My hobbies include beautifying others, traveling, learning new and fun and interesting things, and meeting new people. I’m originally from New Jersey. I grew up in New Jersey but have lived in the south for over 40 years. I’ve worked as a tour guide for a dozen years! I’m a freelance writer. I’m working on an American Novel in my spare time. I enjoy running, tennis, playing darts and reading. I also like throwing things like Frisbee and Golf Discs. I wanted to be part of a company offering career growth with sharing my passion for introducing visitors to the beautiful history of Savannah – that’s what brought me to Old Town Trolley. I am from Metter, Georgia. I have one sister, Sharon, and a nephew that I love too much for my own good. I love the Georgia Bulldogs! I love most sports. I enjoy gardening, travel, cooking and spending time with my family. I most of all love Christmas: Christmas music, Christmas trees, anything Christmas related! I previously worked for Old Town Trolley Tours and realized that I have never been happier at any job. I look forward to giving as much to OTT as it has to me. I’m originally from Miami, FL. My son and I live on Tybee Island; he’s lived there all his life. We have a great dog named Rocco and we love our life. I love to garden. I don’t think I’ll have time to do a big garden this year. I’ve worked here before and I do know this a fun place to work. but have lived the past nine years in Denmark. I started working with computers in 1978 and worked for Dell Computer for 10 years while in Austin, TX. I have worked in every field (hardware, software, networking and the creation of websites). I am a musician and love music, whether it’s attending concerts or getting together with friends around a campfire with Alexa. I also love to travel and have visited 40 countries around the world (so far). I love to work outside, meet new people and talk (just ask my mother); so I am really looking forward to working here with all of you at Old Town Trolley Tours of Savannah! Born December 5th, 1954, I proudly share a birthday with Walt Disney. I was born with a natural flair for history. I was raised in Culver City, California, “The Heart of Screenland,” home of MGM Studios, where Gone With The Wind, The Wizard of Oz, The Twilight Zone and hundreds of movies and TV shows were filmed. At nearby Hughes Aircraft, military jets were built and tested. In a sleepy 60s-Era working class suburb of Los Angeles, I came of age serenaded by a surreal (and loud) mix of sonic booms and Hollywood sound effects. At 21, I earned a BA in English from Loyola Marymount University. After a stint working odd jobs and odder jobs, I sold my car, quit a menial gig and split: to either lose, or find, myself in Europe. I visited nine countries, worked on a boat in Greece, saw the Pope in Rome on Easter, visited every museum on the map, fell madly in love with Vincent van Gogh and flew home to LA wildly inspired to paint. I found a studio near the historic canals in quirky Venice, California, where I painted and performed music for 40 years. My prints and paintings are collected worldwide. As Venice grew obscenely gentrified and unaffordable, I felt “homeless” in my own town. A friend bought a house in the leafy green suburbs of Savannah and offered me a room. In December 2017, I sold everything but my books and art supplies and moved here, where I knew only two people. One was a dog. Curiously, the Uber driver who picked me up at Savannah Airport works for Old Town Trolley. Now, so do I! I look forward to sharing my contagious lust for life with others in the radiant ambiance of this profoundly inspiring city. I’m originally from Gary Indiana. I moved to Savannah in 2011 to be closer to family. I’m a people person so I decided to apply for the conductor position. I enjoy traveling, fun times with family, and social events. I’m originally from Sumter, SC. I’m a mother of 1 daughter and I have a grandson who is my world. I have lived in Savannah since January 2002. I love to travel and dining out at some of Savannah’s awesome restaurants. I came to Old Town Trolley because I love to talk to people and I love to drive. I am originally from Gary, Indiana. I am a lover of people – especially the elderly and small children. I am sensitive, caring, outgoing, humorous and full of life. I am married and have a daughter and a son who are my precious jewels. I love to travel, go to casinos, picnic in the park; go skating, bowling, and dancing; read, listen to music, and surf the internet and so much more. Shopping, shopping, and couponing are my favorite past times. I moved to Savannah in November of 2012, and my brother Tony was employed here at the time. He loved his job so much, so I decided I’d give it a try. I felt I’d love it because I love meeting people and enjoy conversing with others. I knew no two days would ever be the same. I’m originally from Manning, SC. I currently reside in Brunswick, GA. I have a sister and nephew who live in St. Simons Island. I enjoy bike riding, frisbee and walking in the park. What brought me to Old Town Trolley was the history and beauty for the city. I’m originally from Daytona Beach, FL. We are a family of tall people; we are lighthearted, kind, people. I would describe myself as funny and entertaining, but I’m a reasonable guy. I enjoy hiking, acting, cooking and especially traveling. When I’m home, I play video games or play with our family dog. I enjoy history, entertaining and traveling. Old Town Trolley encompasses all three of these; that’s what brought me here. I am originally from Irvine, California. My parents are from Israel, but I grew up here in the US. I’m an artist and a writer with a love of fantasy and sci-fi. In my free time, I read comics, play video games and draw. What brought me to Old Town Trolley was moving to Savannah. When I moved here in 2014, I had never been anywhere in the South before. I fell in love with Savannah’s beauty and history and I look forward to sharing that love with others.